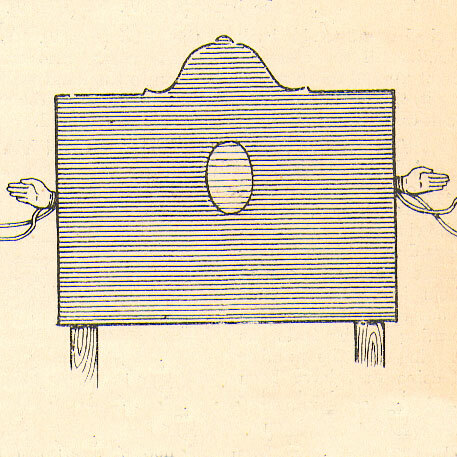 A square cabinet is erected upon a short platform, which is examined by a committee who assist to erect the same. A lady is now introduced, and seated upon a chair inside the cabinet, her wrists being fastened by two ribbons, one hand showing at each side of the cabinet and her face at the window. Various articles are borrowed from the audience and placed in the cabinet, and immediately spirit manifestations occur, such as bells ringing, articles vanishing only to reappear in the hall, and an animal production in the cabinet. The secret is that the legs of the stand or platform are hollow, the top traps being kept closed by means of strong iron rods, which also serve to open them when required from below stage. The borrowed articles being placed upon the floor of the cabinet, are pushed near the traps by the girl’s foot, which the assistant under the stage opens, and rings bells, which he gains possession of by pushing his arm up the hollow leg. The traps are disguised by the decorations.